Break out that Bluetooth controller, Steam is coming to mobile devices! 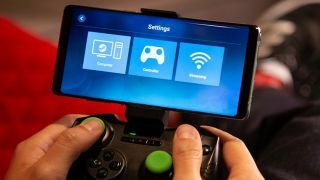 When we heard Valve was making an app version of the Steam Link, we were surprised - shocked, really, that Valve would have the audacity to shrink the hardware it worked so hard on to the size of a mobile app. And yet, here it is, available to download … at least in beta on Android. If you head over to the Google Play Store right now, you can find the Steam Link app, which has the ability to stream games over your local network from your PC to your smartphone or tablet. While the Android version of the app is available now and will spend the next week in beta before officially launching on May 21, Valve says the iOS version should be coming soon, but is “pending further review with Apple”. Both the iOS and Android version are free to download and use - Valve has no plans, at this point at least, of charging for any of it. "My whole Steam library on mobile," you say, "that's great!" It is, but before you pack your bags and head out the door prepared to play games like Grand Theft Auto V or The Elder Scrolls V: Skyrim on your daily commute, there are some limitations to what the Steam Link app can do: First and foremost of those is that it only works with a PC that’s on the same network. Head outside and out of range from your Wi-Fi, and you won’t be able to access Steam. Speaking of Wi-Fi, Valve heavily recommends that you use the app only on a 5GHz Wi-Fi connection or connected via an Ethernet adapter to your router - try to use a 2.4GHz signal, and you might not get the most optimal streaming experience. The Android version of the Steam Link app is supported on devices running Android 5.0 and higher, while iOS users will be expected to run iOS 10 or newer, and any Apple TV running tvOS 10.3 or newer - yes, it even works on Apple TV. The app itself is free to download on both iOS and Android, starting with Android, and we’ll update this story once the iOS version hits the App Store.